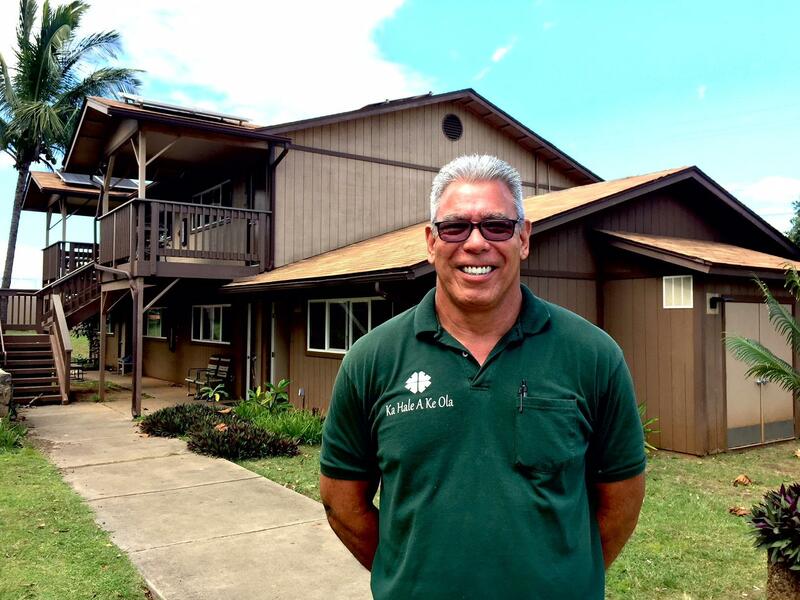 Homeless on Maui who are fortunate enough to get into Ka Hale A Ke Ola Homeless Resource Center in Wailuku, are greeted by this man, Lee Thompson, Director of Operations. The day i visited, nearly 250 people were being sheltered in their dorm and in the complex's 72 two-bedrooms and studios. Thompson keeps order, supervises maintenance, and teaches classes in how to care for a residence. He's seen here in front of one of Ka Hale A Ke Ola's inviting housing units. KHAKO's Housing Program Director, Joy Rucker, has worked with homeless for decades in Los Angeles, San Francisco, and briefly on O'ahu. She says the move now to get people into housing, then connect them with services and resources in the community, appears to be working. 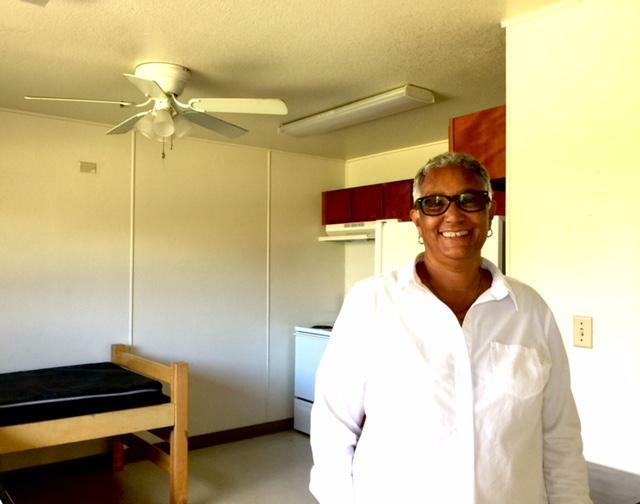 Rucker stands in one of the two-bedroom homeless units. She has recently moved to project in Texas. A visit to Ka Hale A Ke Ola Homeless Resource Center's facilities in Lahaina and Wailuku. 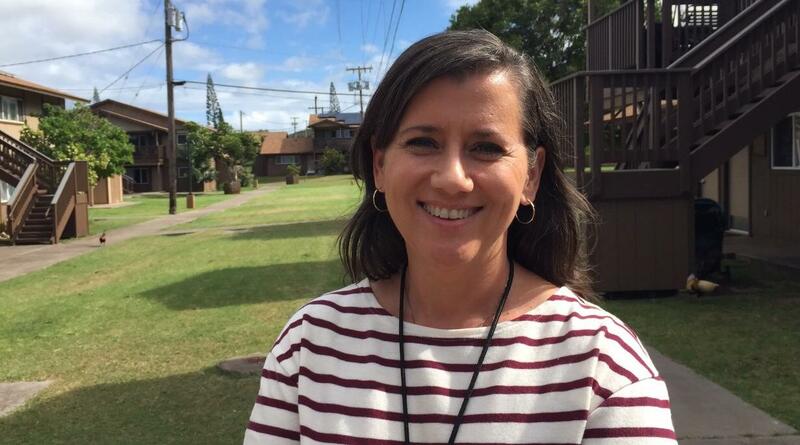 Joy Rucker is Housing Program Director for Ka Hale A Ke Ola Homeless Resource Centers, both in Wailuku and here in Lahaina. Homeless families and individuals come here to become Housing ready. There’s a lot of respect evident in the way this place looks and runs. Rucker: People see the most chronically homeless on the street and assume every homeless person is that person. It’s not true. The people that we see on the street are the most chronic, they have the most mental health issues and the most severe substance abuse issues. Ka Hale A Ke Ola's CEO, Monique Yamashita, is proud of the work being done by her organization. She says they get 4-5 calls for shelter per day, with only two agencies and three shelters total on Maui. Ms. Yamashita says, she senses a national feeling that Housing First is working, and we are getting a grip on the homeless problem. Yamashita can see a day on Maui when there are only episodic homeless, or situational homeless, on a very temporary basis. Monique Yamashita is Executive Director of Ka Hale A Ke Ola, she says they get 4-5 calls for shelter every day. She says they used to keep out a lot of people with drug or other issues, and those that were in, would stay for two years of programs. Now there’s an emphasis on getting the clients into shelter in 60-90 days, then connecting them with programs in the community. Yamashita: Lowering our barriers as a shelter, that was really scary. We actually put barriers in place that stopped people from coming into the shelter. When I say barriers, we used to drug test people, so they had to clean and sober to get into the shelter and Housing First model says that’s not the best way to help individuals. You want to get them in so that they can get the help so lower the barriers so they can get in the shelter, start getting the services they need, and get them housed. Yamashita says, with all the drug and alcohol users in America who are housed, clearly those habits do not preclude shelter. Yamashita: This makes sense: many people using drugs and alcohol are housed. We were told that, and a light bulb went off. That’s right, there are many families who use drugs and alcohol and they are housed. A lot of people have big families, says Jennifer Magaoay, Housing Specialist for Ka Hale a Ke Ola. That can be a problem. She connects with landlords, realtors, property managers, and resident managers, to build rapport and tell them about ongoing support her clients get once they are housed. They are assisted by a Housing Retention Specialist who guarantees payment and upkeep, even when clients cannot be contacted. Magaoay: There is a stigma here in Hawai‘i that homeless means drug addiction, poor mental health, no job. But really there are a lot of homeless people who are here because people gotta work two jobs just to suffice their rent, to take care of their family, to buy food and put food on their table A lot of people have big families. Children are, I cannot say a barrier, but a lot of landlords reject our clients because of the amount of children, the age of the children. Interior of KHAKO's 2-bedroom homeless shelter. 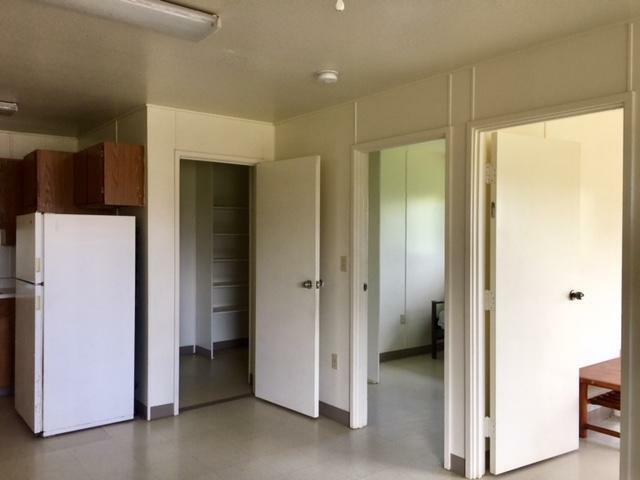 Affordable rentals are the big need on Maui, and adjacent to the homeless shelter, is KHAKO's 200 unit affordable housing development. Those units can accommodate large families. Magaoay: I try to broaden their view, the homeless are not bad people. I let them know about our Housing Retention Specialist who will follow them for nine months to make sure they pay their rent, don’t damage the property, to make sure there’s always someone they can talk to if the tenant is not available. They love that. Magaoay says she makes sure the landlord/tenant relationship is a match. Magaoay: Putting them with someone they connect with will hopefully keep them housed longer. So far, so good! I’ve built a lot of relationships with property managers, landlords. They call me, let me know, I have a unit open, do you have anybody? Magaoay says she calls all of her contacts at least twice a month. Even those who are safely housed can call on Jennifer, who has been a housing intake coordinator, housing navigator, case manager and now is a housing specialist, so she knows every step of the process. Ms. Magaoay says she had a landlord who met a one of her clients, and responded by saying she had heard bad things about the shelter homeless. Magaoay: I got really upset. I told the landlord, that’s the stigma that’s going on. I want you to know these people here have a story. They go through things. Nobody’s perfect, nobody’s rich. Nobody just takes off and goes to the bank. They work hard. They have kids, they have to work two jobs. Sometimes they sacrifice things just to put food on the table. Magaoay: Not all people who become homeless and end up in the shelter have a drug addiction. They’re not violent, they’re not dirty. They don’t have mental health (problems), it’s just that it’s expensive to live here on Maui. And some people are not fortunate, like others that own property, that can take money out of the bank and say, Hey I want to buy that. Magaoay: These people live paycheck to paycheck. We try to encourage them to be able to see they can increase their income so they can have a little more, so they not only live paycheck to paycheck but they can have something nice for themselves. Magaoay says negative stigma is a primary hurdle for homeless families, especially. It’s something the community has to overcome. She says that land lord apologized and opened her doors. Deck of one of KHAKO's homeless shelter units. The entire development began in 1986 with the recognition of a homeless problem. 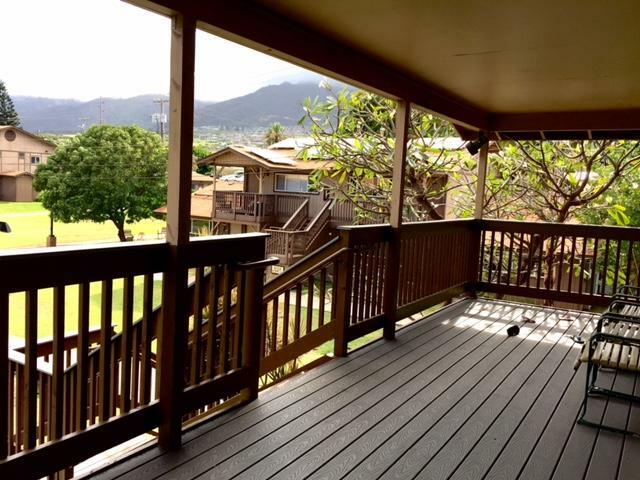 KHAKO opened in Wailuku in 1995, and the Lahaina shelter opened in 2004. In 2017, the two shelters served almost 45 thousand meals, ten thousand less than in 2016. Why? CEO Yamashita says it's because of changes in the program. No one stays longer than 9 months. Magaoay: Standing up to people like her, gave her the courage to rent to my clients. Today she has given me three units. She took the chance I think people, landlords, tenants, realtors, should give that chance. Magaoay says she will never go through with anything but a perfect match. She will not risk her clients getting kicked out. Magaoay: To me that’s a failure. I feel like I’ve failed. I house them, when the move in, I go with them. They meet the landlord, they meet the realtor, I introduce them. I see them open that door to their new house and it brings joy to me, honestly. Magaoay: The children are like, Yay! I tell them, go to your room, they’re happy! That’s my goal. If it takes me a little while, I want to make sure they’re housed in a place they want to be housed. That they will be treated fairly. Just because they came from a homeless shelter, doesn’t mean they are the perceptions of how other people think. I’ve seen a lot of people get housed and they stay housed and they’re happy. It’s easy to visit Maui, and not see the homeless, they’re not all on sidewalks as in Honolulu. We’ll take a look at where they are, coming up. According to Buddhist tradition, summer is the time of year that spirits of the dead return to visit with their loved ones on earth. Far from being a scary thing, the idea is a village-wide celebration to welcome them back. HPR’s Noe Tanigawa and Catherine Cruz discussed Hawai‘i style bon dance on The Conversation.